We’ve received a LOT of new readers lately and as such I’m hearing a lot of questions that are also covered in articles in the past. So today I thought I’d help someone find an article on the use and selection of powdered milk that I swore I had written at one time. But I gotta tell ya, I’m not all that impressed with the search features of Wordpress. I figure if I can’t even find the dern-blasted article, then how can I expect anyone else to. So, I’m going to provide some basic powdered milk 101 kind of information today that will hopefully answer a lot of questions. For starters, understand that to me powdered milk was a cruel form of torture inflicted on me as a child. I can still remember the stench in the kitchen when Mom would try to mix it ½ and ½ in the regular milk. Truth be told, I don’t think Mom liked it much either and thus she started getting raw milk for us kids. Hallelujah! So frankly, having been suitably scarred as a child, I never in a million years would have believed that I could actually find a powdered milk that I liked nor one that I could sneak on my husband. But find it I did after attending a cooking class. In fact, I found several powdered milks that I like the taste of, believe it or not. It’s important to note that most powdered milk has had the nutrients added back in so that it’s “just as nutritious” as the regular milk you buy. Frankly, I feel like a total liar when I say that though without clarification. Fact is, the regular milk you buy is awful, in my opinion. Now I’m scarred for life for another reason after reading “The Untold Story of Milk.” As a result I purchase only raw milk. Powdered milk however has a little different story. I would trust it a heck of a lot better than the regular stuff I buy because of how it’s “powdered.” To put it simply, everything is stripped of it, then it’s dried, and then nutrients are added back in. So in my mind I feel like drinking powdered is actually better for me than the regular stuff should I run amuck in having access to my raw milk. 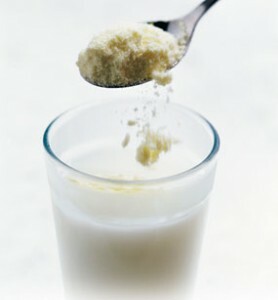 Most powdered milk is akin to skim milk in taste because the fat is usually removed from it for processing. So if you see a powdered milk that says “whole” chances are they have painstakingly added back in some of the milk fat OR some other alternative fats. So be choosy when selecting a “whole” powdered milk. Ironically there are a lot of folks who have previously been lactose intolerant but who are able to tolerate a good powdered milk. This is because of the extraction of some of the parts of traditional milk during the drying process. If you’ve got a real powdered milk stored in a sealed bucket or a #10 can, you can easily expect 20-30 years of shelf-life from it. (That which comes from Costco in the big orange boxes doesn’t store as long. However, even old powdered milk can make a lot of the other things I make with milk) When you have a real powdered milk, you can expect to be able to make ricotta and mozzarella cheese, sour cream, cottage cheese, sweetened condensed milk, buttermilk, and even a whipped topping. So as I have invested in powdered milk over the years, I don’t just view it as drinking milk—as I haven’t just gulped a glass of milk down since I was a teenager—rather I see it as a great source for some of the dairy products I’ve really come to rely on. With most brands of powdered milk, you will have a tough time making yogurt though—but it IS possible, Folks. However, generally speaking, yogurt and kefir making goes much better when made from raw milk. 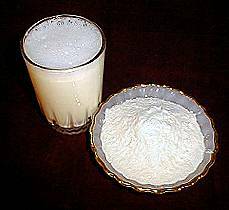 Powdered milk is also quite reasonably priced when you purchase in bulk. As of last month, my average price for powdered milk works out to only 99 cents a gallon! I just keep watching for sales and then when the price is right, I pounce like a hungry kitten. 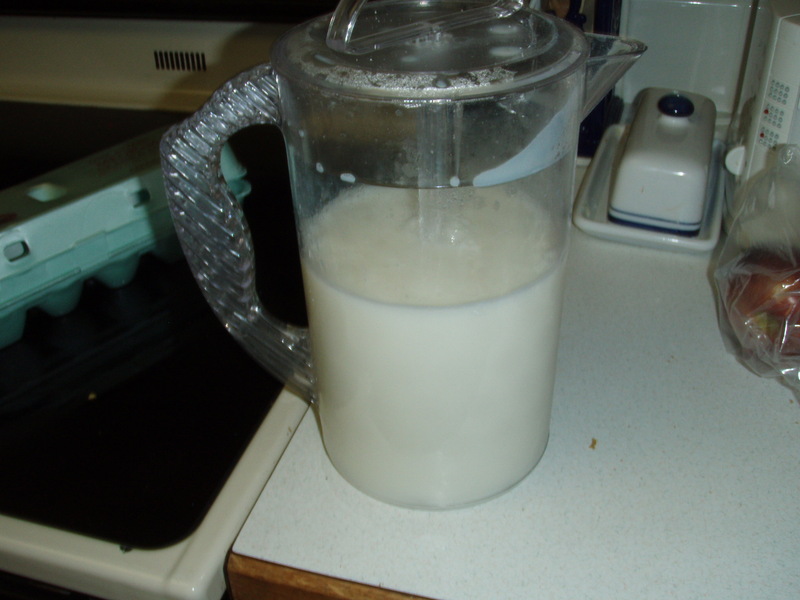 The nice thing about that is that prior to powdered milk, we used to waste a lot of milk in my house. It would simply go bad before I had the chance to use it all. But with powdered milk, I can make up as little or as much as I want—easy peesy. So nothing has to go to waste. One tool that I cannot be without is my little plunging/mixing pitcher. I bought mine from Pampered Chef, but I’ve seen similar ones at other kitchen stores. These kind of mixing pitchers can make all the difference in the world to the taste of the powdered milk too. There’s nothing worse that going to take a sip of powdered milk only to be greeted by a glob of musty smelling powder. My favorite powdered milk is Country Fresh by Augason Farms (aka Morning Moos). It’s equivalent in taste to a skim milk. When I first tasted that at a class I begged the instructor to let me take some home with me so that I could try it out on my husband. If I could get it past him, I was definitely going to buy it. Sure enough, I brought it home, said “Here. Drink this.” My husband looks up at me a bit skeptically andtrusting me, he drank it. When he was done he placed the cup down triumphantly and said “It’s milk!” I said, “Nope. It’s POWDERED milk!” It took some convincing that such was the case. He was sold. 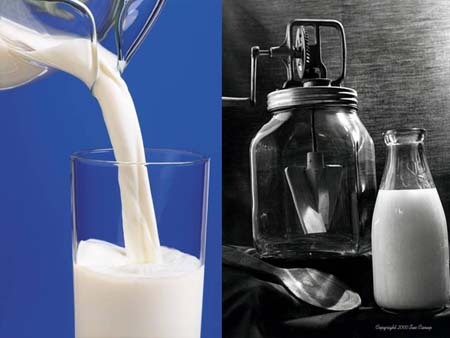 Augason Farms (formerly known as Blue Chip Foods) also makes a milk that was created specifically for children and others who need a little fat in their milk. That milk is called their “Morning Moos Milk” and is labeled appropriately as a milk alternative product. The reason being is that they’ve added flavoring back into the product in addition to fat. I’ve got to tell you, the flavored milks that they have in the Morning Moos line is delightful! Their chocolate milk tastes like a cold fudgesicle! They also have an orange and a strawberry flavored Morning Moos milk. The orange takes me back to the days when I used to buy orange push-up pops from the ice cream truck. I am frequently asked about my opinion of the milk that is sold by the LDS Canneries. One thing I have to say is if the LDS Cannery produces it, its high quality and I don’t have to worry about corn syrup and other garbage in it. And frankly, I don’t mind using it at all for baking and cooking, or even for making other dairy items from it. But it’s got just a little too much of that powdered milk taste for me to pour it over my oatmeal and not notice the taste. Then again, it’s usually less expensive than the regularly priced milks I’ve already mentioned. So perhaps I can use the LDS Cannery kinds I’ve got specifically for baking, etc. and leave the others to chugging. So here’s your go-to article for basic info on powdered milk. I’m going to give you all an A+ for attending today’s class of Powdered Milk 101. But I’ll give you extra credit if you actually push past your comfort zone and TRY some for yourself. It is an important part of your food pantry. I once read a book of a woman who did an experiment for a year and lived off of wheat, salt, honey, and powdered milk. There are so many possibilities for you when you’ve got it. And I promise you, I’ve got a pretty picky palate (I can always taste whether or not a baker has used too much baking powder or soda in their cookies or if a baking mix has gone rancid). So I assure you that if I can find a powdered milk that passes my standards, there’s bound to be one that will pass yours! Thanks for the info! I can't wait to try the Morning Moos for my kids! So far I haven't been able to get them to drink the $8 gal. raw milk, but maybe they'd like this better. What about powdered soy, or almond milk? Any info on where to buy, how long it will keep, etc. There's a great article on here about almond milk that comes up easily in the search. I'm definitely not a fan of soy though. Because how it's processed makes all the difference in the world. It could go from being healthy to being harmful, especially to estrogen levels. I haven't found a single soy product that I trust yet with the exception of the Reliv products. Soy is touchy business. I bought a lot of old style powdered milk when I started prepping (Panic Mode). It's okay I use it for baking and it works fine for me. I got some Morning moo for the picky family members and kids. Huzzah! I found a gal local that offers real raw milk and also does cheese making classes. Plus Mom got a hand crank Ice cream maker, I got an electric one at the local thrift store, about $10.00 for both of them. I've used UHT shelf stable milk in cooking. I got used to it in Germany where it's about the only milk you will find in the German stores. I was wondering if you had an opinion on the UHT milk? Never heard of the UHT milk. But there is Gossards here which is actual milk that is used in a lot of the military commissaries. It only is said to have a 6 mos. shelf life, although I've had it last plenty past that. UHT (ultra-high temperature or ultra-heat treatment) is also know as ultra-pasteurized or ESL (extended shelf life) treatment, which is defined by 135°C (275°F) for a minimum of one second. More and more it's now simply labeled as "fresh Milk" and somewhere on the package it may note extended shelf life. It's more common in Canada and Europe and in US cream products, I imagine that in due time it will be common in all US milk. I use powdered milk from the LDS cannery for making yogurt, and it works great! It does not have the powdered milk taste, but it is very sour, though. I have to add quite a bit of jam or canned fruit (with the syrup) to make it taste good. 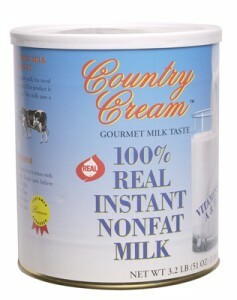 I like Country Cream and Morning Moo's milk alternative for drinking. I'll have to try Country Fresh. I buy (and rotate) Nido whole powdered milk. It's much better tasting than nonfat powdered milk, even if it has a short (approximately 2 years) life. It also tastes great in coffee. Whole milk is recommended for babies over a year old--if I had a small child, I'd be storing even more of this milk. I've also found the UHT milk at Dollar Tree of all places--it's a little spendy at $4 a gallon, and it only has a stated shelf life of 6-8 months, but it's great for camping and travel. I keep meaning to buy a couple of boxes and deliberately let it get outdated, and do some taste testing. Tina...I just opened some UHT milk I bought from the Dollar Tree 2 years ago. Put it in the fridge and it tastes great! Tina that's where I get my UHT milk. I don't think it is the only milk to buy but it does give you some flexibility. I'm doing a test of mineral oiled eggs and comparing them to store bought eggs. I can get a good 6 months easy from store bought eggs. Yolks break awfully easy on store bought eggs. But I think real eggs may do better. I'll get you all an update at 3, 6 and 9 months. I don't think I'll stretch the time longer than 9 months for now. I avoid the Morning Moo because of the corn syrup solids. I use the LDS cannery milk and have also made wonderful yogurt with it. I find I like milk mixed up better if I use a little less milk powder than what it calls for so experiment. I use 1 c. per half gallon. Also add 1 t of vanilla flavoring when you mix it and that helps give it a good flavor! We've used this milk for about 35 years and figure I have saved over $25000 in milk price difference over those years! Yeah, I don't care for the corn syrup either. And yes, it's the LDS brand AND the Country Fresh that I've made yogurt with. good to know, thanks! i'll see if i can find those brands. and just a comment about raw milk, while i haven't had raw cow's milk in years, i didn't like it. now raw goat milk, yum!! I would like to know where to buy raw milk. It varies by state. Some states simply don't permit it. If I were you I'd google "where to buy raw milk" and see what you can find for your location. You didn't mention the difference between instant and non instant powdered milk. The LDS cannery sells non-instant. So in recipes you use 1/2 the amount. For example: in making evap milk you use 1 1/2 c. water and 1/2 c. non instant powd. milk, if using instant you would need to double and use 1 c. instant powd milk. I store the LDS cannery milk for cooking to save money and buy the country fresh for drinking. I love to cook with powdered milk, powdered eggs & powdered butter in all my bread recipes. It makes things so much faster and not as many dishes. Rebecca, I believe it's actually addressed at the first part of the article--use of hot water or not hot water is the primary difference. There is a box to click on to find participating dairies in your state. We switched to raw milk a month ago. We love it - and love to experiment with it. Yesterday my college son and I made fresh mozzarella cheese. Then we used the left over whey to make pizza dough, and used most of the mozz on top! It was awesome!! We live in Michigan and are able to buy raw milk by purchasing a share of a cow(s) and paying a weekly fee for upkeep. In exchange, our cow(s) give us a gallon of milk. We can obtain more if necessary for making cheese. If it looks like TEOTWAWKI is imminent, I will be finding me a cow real fast. I already have a source nearby. Until then, I will enjoy someone else maintaining my cow! I believe in learning new skills in case I will ever need them. Making cheese (hard and soft) is right up there at the top of my list. I wouldn't be waiting until something "imminent" shows up. I'd be looking for that cow now. How much does it cost for the upkeep of the cow, and how much milk do you get in exchange? That sounds like a GREAT idea. I might just do that with some dairy goats here in Ga. Thanks! Goats are a great source for raw milk. We have Nigerian Dwarfs and their milk is sweet...honest. They are a smaller (i.e. dwarf) milking goat. We have had the larger goats also and had excellent milk from them. We went to the dwarfs because we couldn't drink the milk fast enough. As it is I have a refrigerator full of milk that I'm going to make vinegar cheese out of. Goat milk gets a bad rap for being off flavor. The key to good goat milk is to NOT let them roam and eat anything and everything. Whatever they eat or drink will show up in the taste of their milk. Dirty water, weeds, etc. We feed them alfalfa, oats, sweet mix (grain). The goats (any type) are smaller than cows so consume less. And unless you have an outlet for selling/trading/ giving away your excess milk there will be a lot of waste. You may think you need a cow but believe me 2-4 gallons of milk every. day. adds up quickly. It's much more difficult to get cream from goats milk, and I a LOVE-A Love-A my cream cheese, etc. But I also love goats milk! Kellene, do you have a suggestion for someone who dislikes milk entirely? I absolutely can't drink milk straight, and when I eat cold cereal I put as little milk on it as I can manage. Luckily cheese & sour cream are high on my list of favorites, so I don't worry about calcium deficiency. I did buy some Morning Moo's Dry Milk Alternative and it's not horrible but I don't actually like it. I'm not partial to soy or almond milk either. Actually, yes, I do. When I hear of a person with so many fundamental dislikes, it tells me that there's a whole other problem and it's usually rooted in their health. Are you diabetic by chance? Do you suffer from depression or obesity? Do you have trouble sleeping? What I would suggest is that you eat more healthy foods exclusively for about 2 weeks along with a liver cleanse protocol and then see if your taste buds haven't changed at all. I suspect that almond milk will then be quite tolerable for you. Great info. Visited Sprouts grocery yesterday. Goat milk was $7+ for 1/2 gallon! Wish my HOA would let me have a dwarf goat. Anyway, my question is: where can i find the book you mention regardin% the person who lived on only honey, wheat, salt and powdered milk? 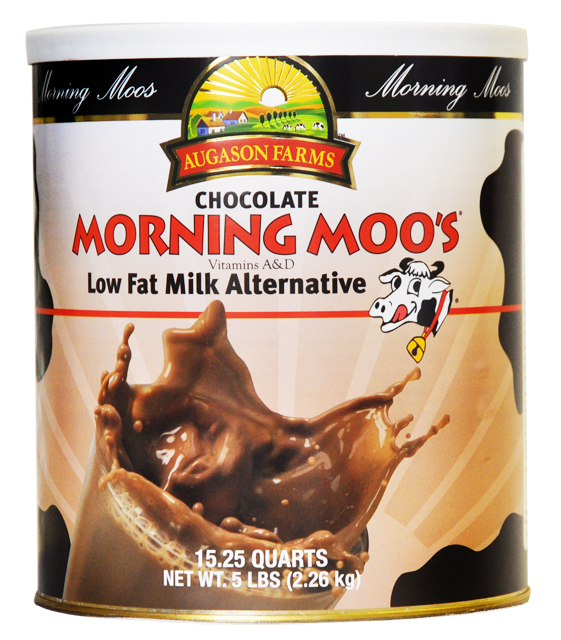 I bought small bags of Auguson's chocolate and white Morning Moo to test before plunging into storing large amounts. I prepared a quart of each, regular milk and Shop Rite powdered. Surprisingly, my grands picked white Morning Moo over store bought milk. The powdered milk was dead last with icky faces. They LOVED the chocolate but I knew if I offered that first, they wouldn't accept the plain. Yesterday our local paper ran an article warning of imminent food prices increasing up to triple what they were 6 months ago. I placed my bulk order for white and chocolate Morning Moo. So glad you posted this! 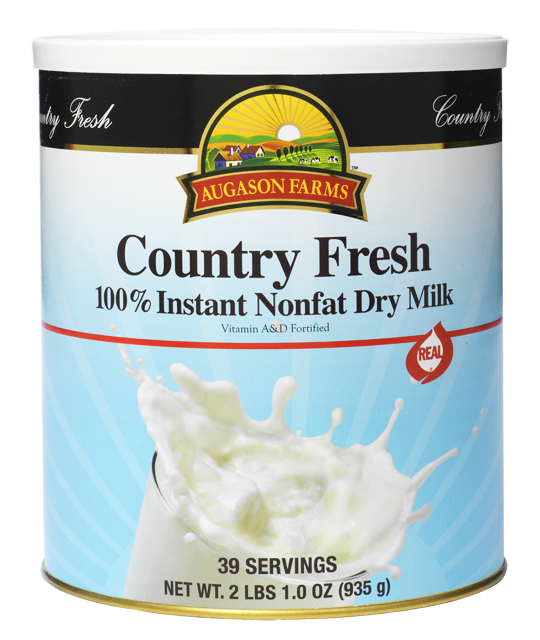 I just got my first shipment of Augason Farms products (purchased through Sam's at pretty good discounts) and was hoping the powdered milk would be good! I ordered a six pack of the #10 cans and it is fantastic! I'm not a big powdered milk person, but this stuff mixed up smoothly and tasted just like it should, even before refrigerating it. Can't wait to try their Morning Moos! Kim, I'm so glad it worked out for you! Everyone has a different palate so I'm glad it met your criteria! Even better that you got it at Sam's for a good price! I'll have to check that out because I always have free gift cards that are good for Wal-Mart or Sam's. Like a spazz, I totally didn't even think about going online to Sam's and checking that out! Oooh. OOh. You just gave me an idea for another article! Thank you! You are so welcome! I am learning so much here and finding so many great ideas. Happy to return the favor whenever I can! So...just a clarification, you have made mozzerella cheese with Morning Moos milk??? I really love that idea if its true. :) I'm really enjoying your blog, and you bring up some great questions! No, only with REAL powdered milk, not a "milk alternative" product which is what the Morning Moo's is. i found some morning moo at sams online that doesn't say alternative. do you think i would be able to use it for mozzella cheese? The Morning moos brand IS an alternative. Why no soy? I cannot drink normal milk or any powdered milk that I have tried. I have used Silk for a few years. Is there a problem with Silk specifically? How do I make ice cream with morning moo or powdered milk? Kellene, how in the heck are you getting powdered milk for $.99 a gallon? The cheapest I have found , on sale for the two you recommended, was $2.34 and $3.55 a gallon. :( Any suggestions? When you get it on sale in the big 5 gallon buckets, you can get it for that price. It's all about the sales, Baby, and stocking up when they come. I have got the morning moos in the big five gallon buckets, but I have never seen the country fresh or country cream come in something that big. Do I need to talk to someone at Auguson Farms about that? Also what do you think about their Swiss....?milk, is it any good? Thankyou so much for all of the time you put into helping all of us! I will be down in your neck of the woods today buying some raw milk, Yeah!! !....Homemade yogurt tomorrow,...it is soooo good! Their Swiss is whey, so no, I've never tried it. I'm not certain you can get it directly from them in that quantity, although they do have it in the stores that size. I think I'll go and enjoy a nice cold glass of my powered milk! Next I'd like to try your brand, sounds yummy! Just took a look at my bucket of milk, and guess what? It's Maggie Moo's brand (my sister gave it to me a few years back - it's from Blue Chip Foods.) Maybe because it's older, not sure, I have to mix it with hot water. Oh well, it's still delicious. I'm thinking I'd like to order more, as well as some of the Chocolate variety, which I think everyone in my house would love! Just might change their minds about powdered milk! Just wondering the best powder milk to feed my 14 month old daughter I live in Saskatchewan ??? Kayla, there are Thrive Consultants in Canada and you can obtain the Thrive powdered milk that has additional fat in it for growing kids up there without the exorbitant shipping costs. The Thrive Powdered milk is at the top of my list for taste too.